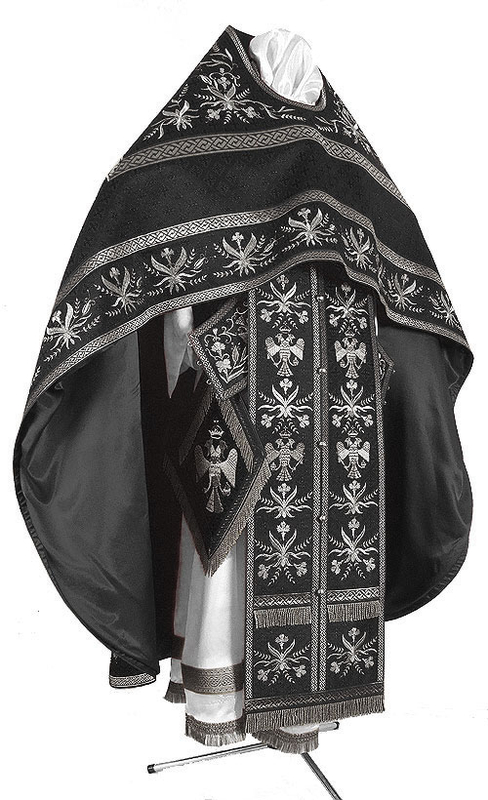 Istok Church Supplies creates handcrafted, custom Russian Priest vestments in black and silver. These high quality liturgical garments are made from rich ecclesiastical fabrics and conform to centuries old traditions. Our aim is to help Orthodox Russian Priests dress appropriately as they engage in leading the devout in worship. 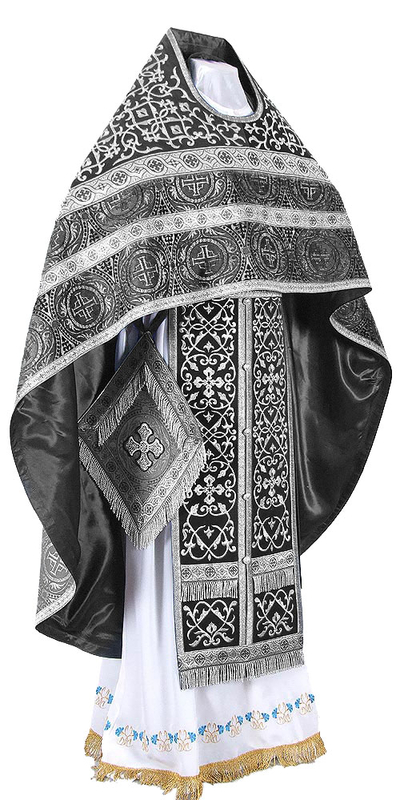 Our impressive collection of black and silver Russian Priest vestments are ideal for solemn periods such as the Holy Week and weekdays of Lent when the faithful gather to participate in sacred services. We offer four material choices – rayon jacquard brocade, metallic jacquard brocade, German velvet and embroidered fabric crafted with fine German Madeira and Gunold threads. Customers can choose from a wide variety of attractive fabric patterns according to their requirements and preferences. 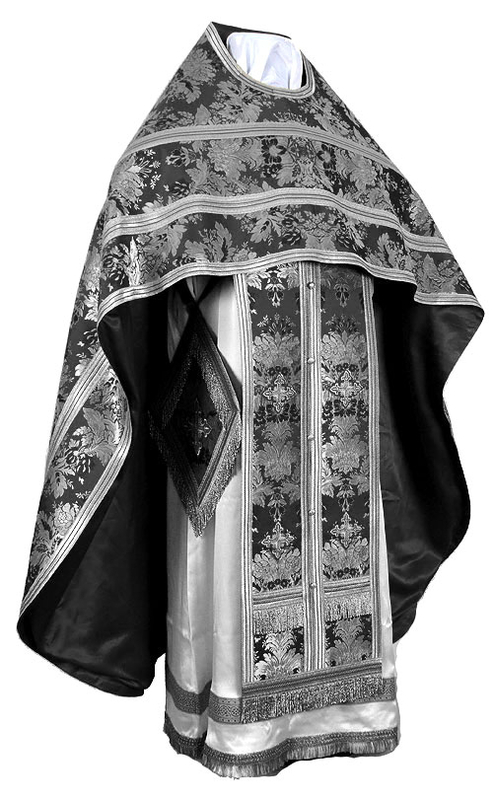 We offer black and silver Russian Priest vestments as complete sets. Each basic set includes phelonion, epimanika, zone, epitralhilion, epigonation and nabedrennik. Customers can upgrade their orders by opting for matching chalice covers, a matching podriznik and an embroidered icon for the back of the garment. Customers can also enhance the value of these garments by opting for natural velvet inserts. Russian Priest vestments are custom tailored according to individual measurements and we request you to send in your correct measurements so our dedicated tailors in Europe can create perfectly fitting vestments. Decorations are an important part of a Russian Priest’s official vestments and we understand everyone has their expectations and limitations. We offer three different types of adornments to choose from. For our economically priced standard decoration, we provide inexpensive galloons and plain crosses. For our mid-range premier decoration, we offer high quality galloons and beautiful crosses. For premium luxury type, we provide solid jacquard galloons and hand embroidered crosses. Nobody does a better job of delivering custom sized Russian Priest vestments than Istok Church Supplies. Please browse through our extensive collection and place your bespoke order.